If you read my last post, you know that I've been under some stress lately. 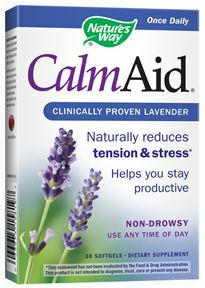 I was sent a box of CalmAid (lavendar oil capsules) recently to try. They are made by Nature's Way, a company that also makes Sambucus (an elderberry syrup we keep on hand all the time to help shorten colds) and also the Valerian Root capsules that I have used in the past to help me sleep. So, I feel pretty confident in their products. The lavendar capsules are meant to be taken once a day, to help reduce tension and stress. I know that the scent of lavendar is calming, but I hadn't known that the oil could be ingested for the same effects. When I know I am facing an especially stressful day, I have taken one in the morning and it seems to help me feel less stress. The capsules have been tested in clinical studies, but they have not been evaluated by the FDA. If you take any prescription medicines, always check with your physician before adding any supplements. You can find them online, and also at local retailers. Check out the Nature's Way website for more details.